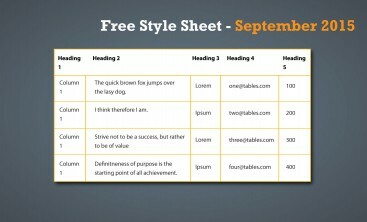 The August 2016 Free Style Sheet is now available. It is based on a shade of violet bold white headers. The borders are the same shade with the rows solid white (unlike May’s free style sheet). 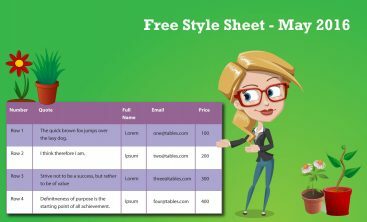 The May 2016 Free Style Sheet is now available. It is based on a shade of violet with bold white headers. Alternating rows of light violet and white with a medium grey text font rounds out this months design. The February 2016 Free Style Sheet is now available. It is based on a material green with bold white headers. Alternating rows of light green and white with a light grey text font rounds out this months design. The January 2016 Free Style Sheet is now available. It is based on a light violet with bold white headers. Alternating rows of violet and white with a light grey text font rounds out this months design. 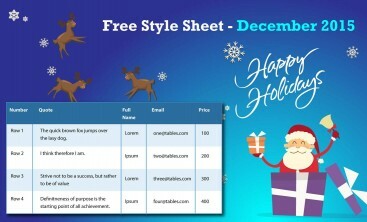 The December 2015 Free Style Sheet is now available. It is based on a muted blue with bold white headers. Alternating rows of blue and white with a light grey text font rounds out this months design. 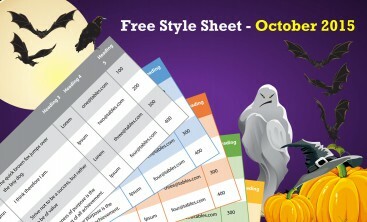 Features of the October 2015 Free Style Sheet include orange grid lines with alternating white and orange backgrounds and bold column and row labels. 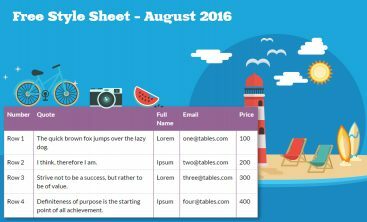 Features of the September 2015 Free Style Sheet include orange grid lines, white backgrounds and bold column and row labels.